Do You Know In What Book Genres Your New Book Should Be? There can be many reasons why a book fails to grab readers, and while this blog concentrates mostly on the technical aspects and marketing side of self-publishing rather than the actual writing process, the choice of book genre can have major implications on both writing and marketing. Writers often start writing a novel without giving their end product much thought, so when it is finished, it may sometimes be difficult to find a precise category or book genre for a book when it comes time to publish. Different genres relate to a distinct target audience. Finding where your book fits is a key decision. You might consider that your book is historical fiction, but does it involve a love story? Is it romance then, or a little bit of both? Is your book nonfiction or realistic fiction? Is it a fairy tale or fantasy? Readers usually have favorite popular genres, so placing your book where they find it has huge advantages. I read a post on Kristen Lamb’s excellent blog recently, where she goes into great depth about how to not only define, but choose a book genre before starting to write a book. You could even apply these descriptions to a short story. In my mind, the advice in her post helps solve two problems at once, in that it gives clarity when writing, and then simplicity when it comes time to publish. I won’t reprint the complete article, Choosing a Genre—Anatomy of a Best-Selling Story, which you should read by clicking the link. But I will quote a small chunk of the post, where she explains with absolute clarity what the major genres represent, and what readers expect from the main character and the plot. – often begins with the crime as the inciting incident (murder, theft, etc. ), and the plot involves the protagonist uncovering the party responsible by the end. The crime has already happened and thus your goal in plotting is to drive toward the Big Boss Battle—the unveiling of the real culprit. Mysteries have a lot more leeway to develop characters simply because, if you choose, they can be slower in pacing because the crime has already happened. Mysteries run roughly 75-100,000 words. Mysteries on the cozy side that are often in a series commonly are shorter. 60,000-ish. I’d recommend that you consult the Mystery Writers of America for more information. – generally involve trying to stop some bad thing from happening at the end. Thrillers have broad consequences if the protagonist fails—I.e. the terrorists will launch a nuclear weapon and destroy Washington D.C. Suspense novels have smaller/more intimate consequences. I.e. The serial killer will keep butchering young blonde co-eds. It is easy to see how thriller, suspense and mystery are kissing cousins and keep company. The key here is that there is a ticking clock and some disastrous event will happen if the protagonist fails. So when plotting, all actions are geared to prevention of the horrible thing at the end. Thrillers can run 90-100,000 words (loosely) and sometimes a little longer. Why? Because some thrillers need to do world-building. Most of us have never been on a nuclear sub, so Tom Clancy had to recreate it for us in The Hunt for Red October (Clancy invented a sub-class of thriller known as the techno-thriller). Pick up the pacing and you can have a Mystery-Suspense. Think Silence of the Lambs. A murder happens at the beginning, and the goal is to uncover the identity of the serial killer Buffalo Bill (mystery), but what makes this mystery-suspense is the presence of a ticking clock. Not only is the body count rising the longer Buffalo Bill remains free, but a senator’s daughter is next on Bill’s butcher block. When plotting, there will often be a crime (murder) at the beginning, but the plot involves a rising “body count” and a perpetrator who must be stopped before an even bigger crime can occur (Big Boss Battle). These stories are plot-driven. Characters often do not have enough down-time to make sweeping inner arc changes like in a literary piece. Pick up the pacing and raise the stakes and you have a Mystery-Thriller. Think Killing Floor by Lee Childs. The book begins with a murder of two unidentified people at a warehouse, but if the killers are not found, what the killers are trying to cover up will have global consequences. And I am not telling you what those consequences are b/c it would ruin the book :D.
– Guy and girl have to end up together in the end is the only point I will make on this. Romance is all about making the reader believe that love is good and grand and still exists in this crazy world. The hero cannot be your Big Boss Trouble Maker (read Structure Part Three if you want to know what a BBT is). Yes, the guy will likely be a scene antagonist, but that is different. Romance, however, is very complex and I cannot do it justice in this short blurb. If you desire to write romance, I highly recommend you go to the Romance Writers of America site for more information and that you join a chapter near you immediately. This is one of the most amazing writing organizations around and a great investment in a successful romance-writing career. – is character driven. The importance is placed on the inner change, and the plot is the mechanism for driving that change. Literary fiction has more emphasis on prose, symbol and motif. The events that happen must drive an inner transformation. Pulitzer Prize-winning book, The Road is a good example. The world has been destroyed and only a few humans have survived. The question isn’t as much whether the man and the boy will survive as much as it is about how they will survive. Will they endure with their humanity intact? Or will they resort to being animals? Thus, the goal in The Road is less about boy and man completing their journey to the ocean, and more about how they make it. Can they carry the torch of humanity? When plotting for the literary fiction, one needs to consider plot-points for the inner changes occurring. There need to be cross-roads of choice. One choice ends the story. The character failed to change. The other path leads closer to the end. The darkest moment is when that character faces that inner weakness at its strongest, yet triumphs. For instance, in The Road, there are multiple times the man and boy face literally starving to death. Will they resort to cannibalism as many other have? Or will they press on and hope? Word count can vary, but you should be safe with 60-85,000 words (The Road was technically a novella). Note: Literary fiction is not a free pass to avoid plotting. There still needs to be an overall plot problem that forces the change. People generally don’t wake up one day and just decide to change. There needs to be an outside driving force, a Big Boss Troublemaker, and a tangible physical goal. Again, in The Road, the man and boy have a tangible goal of getting to the ocean. The only difference in literary fiction and genre fiction is that plot arc is now subordinate to character arc. In commercial genre fiction, the plot generally takes precedence. In Silence of the Lambs catching Buffalo Bill is top on the priority list. Character evolution is secondary. In literary fiction, these two arcs reverse. The character growth and change is of primary importance and plot is merely the vehicle to get them to change. – will involve some degree of world-building and extraordinary events, creatures, locations. In plotting, world-building is an essential additional step. How much world-building is necessary will depend on what sub-class of fantasy or sci-fi you’re writing. Word count will also be affected. The more world-building, the longer your book will be. Some books, especially in high-fantasy can run as long as 150,000 words and are often serialized. 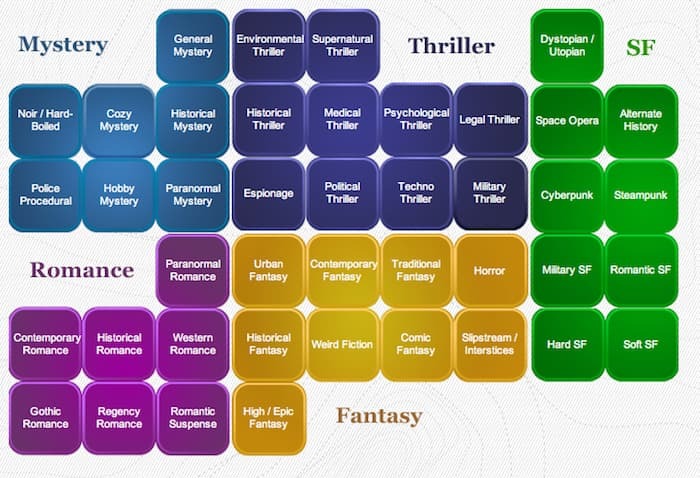 This is another genre that breaks down into many sub-classifications and runs the gambit. It can be as simple as a basic Monster in the House story where the protagonist’s main goal is SERE-Survive Evade, Rescue, and Escape. The protag has only one goal…survive. These books tend to be on the shorter side, roughly 60,000 words. Horror, however, can blend with fantasy and require all kinds of complex world-building. Clive Barker’s Hellraiser is a good example. Stephen King’s horror often relies heavily on the psychological and there is weighty focus on an inner change/arc. For instance, The Shining chronicles Jack’s descent into madness and how his family deals with his change and ultimately tries to escape the very literal Monster in the House. Horror will most always involve a Monster in the House scenario. It is just that the definitions of “monster” and “house” are mutable. Word count is contingent upon what type of horror you are writing. Again, I recommend you consult the experts, so here is a link to the Horror Writers Association. I won’t talk long about YA, since YA beaks into so many subcategories. Often YA will follow the rules of the parent genre (i.e. YA thrillers still have a ticking clock, fast pacing and high stakes just like regular thrillers). The differences, however, is that YA generally will have a younger protagonist (most often a teenager) and will address special challenges particular to a younger age group. For instance, in Veronica Roth’s Divergent, Tris is taking on a very real political battle between factions. But the plot also involves her evolving from child to adult, how she defines her identity aside from Mom and Dad and forging a new romantic relationship with Four. These are all prototypical struggles for someone in that age group. Picking a genre is actually quite liberating. Each genre has unique guideposts and expectations, and, once you gain a clear view of these, then plotting becomes far easier and much faster. You will understand the critical elements that must be in place—ticking clock, inner arc, world-building—before you begin. This will save loads of time not only in writing, but in revision. I hope this list will help you when it comes time to write your next book, and I highly recommend that you bookmark Kristen’s blog and regularly revisit, as her advice on writing is always extremely helpful. What Can You Expect To Pay For Your Book Promotion Campaign? I loved this article! It definitely got me thinking about my book that I’m writing… Mine could fall into the Comic Fantasy category, but also Military Thriller. Would the ¨mixed genre¨ make my book harder to publish/ sell?